The Southeast Mountains of Taipei were the first hiking area I really explored. I live fairly close to them and have been up there a lot. This post will cover the Four Beast Mountains, and Mts Nangang and Muzha behind them. The latter mountains are the most interesting, and a great path runs along a ridge between them. I'm going to share a few of my favorite routes here. There's a more hi-res version to download here. If that link's not working feel free to email me, and I'll send you a hi-res version. Print it and use it to explore the mountains! There are really two levels to the mountains. The Beast Mountains form a lower level of small hills. Nangang and Muzha mountain form a higher ridge behind these (Nangang Mountain is the peak with the TVand radio antennas on top). I'll go over the Beast Mountains but will concentrate on the higher ridge, as I imagine many of you will have already been to Elephant, and maybe Tiger. Lion and Panther mountains are between these two but are very small and not really interesting. 1. 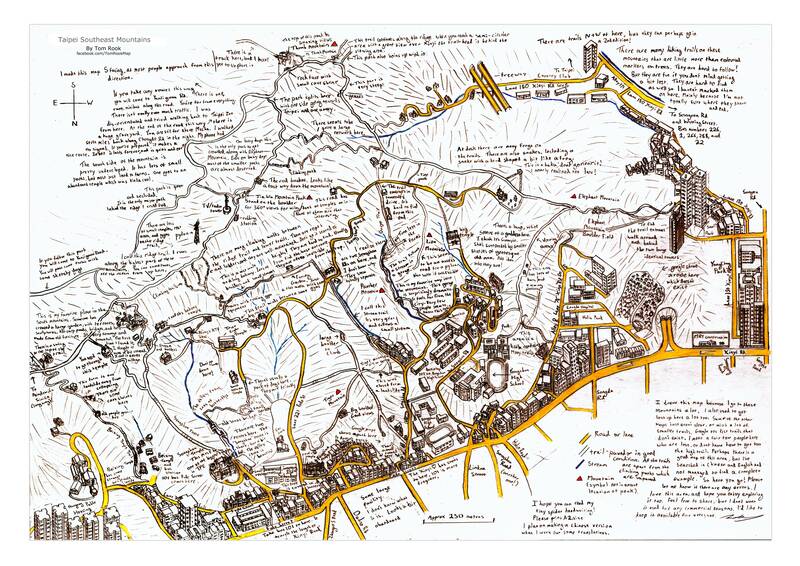 The classic route up Elephant Mountain from the temple on Xinyi Road, Lane 150. This is the most popular path on the mountain and is often packed. There are a couple of other trails up Elephant, but they are much the same. It will take you through the famous boulder area, with a good view of Xinyi and 101. If you continue up past that area, branch off to the right. You'll know you're on the right path when you pass a large white Guanyin Statue. A little further and you'll pass some rougher looking steps going uphill on the left. These lead to the Elephant Mountain Rope Climbing Trails which I'll describe below. Continue further (you'll pass a few graves and a shrine), and up a very steep portion, and you will be at the start of the Ridge Path next to Mt Thumb (see below). 2. The next interesting trail to the east is what I've called the Canyon Trail. This is relatively unknown and a bit rougher. You can find it on Songshan Rd. It goes between Lion and Panther Mts, and confusingly leads to a second Songshan Rd, which runs across the Beast Mountain level of the mountains. It goes through a beautiful and quite remote feeling canyon, following a stream. At a small farming area turn left and you'll emerge onto the lane at a house. There are a number of possible trails onward from here, but if you want to get on the high ridge without using climbing trails, you will have to track along the ridge base. 3. There are many small trails leading onto Tiger Mountain from the Fude Street area. These connect with trails going higher. At night snakes come out. I've seen several on these mountains including venomous habus and bamboo vipers. Above is a small but venomous bamboo viper seen next to the Ridge Path one evening. There are also spiders such as large golden orbs, brown huntsmen in buildings, a couple of large unidentified ones, and even a poisonous funnel web spider. Taiwan has several indigenous funnel web species that are not unlike their Australian counterparts. Thankfully I've only ever seen one of these. 4. The Songshan Temple route is another favorite but it's a little trickier to follow. Go along the river valley beside the huge temple (not on the trail heading up). At the small lane follow up a little way and turn left. Pass in front of a large modern temple and rejoin a paved walking path. Follow this and take the up route when you come to a junction. You will pass The Farm of Eternal KTV (my name, you'll hear why), then come to the main mid level hiking trail. If you turn right you'll head to a garden area and connections to Tiger and Elephant. Turn left and walk a short way, you'll come to stairs heading up next to a weathered plaque. If you head up here you'll pass Secret Village (see below) on your left, and soon be at the Ridge Path. 5. Songshan Temple Up Trail. This path will take you to the same place as above, and is easier to follow, but more boring. It will also pass another set of steps heading up to the Ridge Path before it comes to the Secret Village Path. This is how I think most people miss the Secret Village. 6.. Beixing Temple route from near the end of Fude Street. From Beixing Temple and the bus station there is another route that goes straight to the Ridge Path. 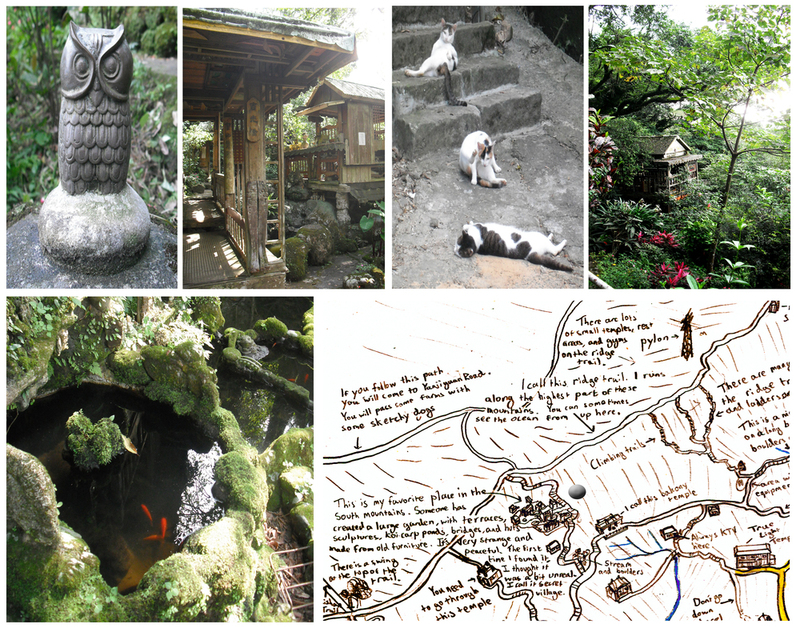 It's not that interesting apart from a series of small shrines on a bare granite cliff face around 2/3's of the way up. There is a swing at the top which is quite nice to chill on for a while. 7. Climbing Trails. There are two main climbing networks I've found on the mountains here. They range in difficulty from quite easy to a bit dangerous. The Elephant Mountain trail turn off described above leads to several. One is quite easy, with a short rope climb up a boulder the only difficult portion. The others are much more difficult and lead up sheer cliff faces in some cases. Only attempt these on very dry days; if you slip it's curtains for you! You'll know which trail you're on fairly quickly after starting on it. The top of one of the climbing trails. They are often hard to find from the top. The other climbing area I've tried is around Nangang Mountain. It's easier to find the entrance if you check on my map. There are a few entrances in or near Fuxing Garden. These range in difficulty too but don't seem as long and sheer as Elephant's trails. There are still some longish ladder and rope sections, so go after a dry period. More recently a trail has been made linking all of the climbing trails about halfway up. So if one looks too difficult you can just wander along the cliff to the next one. The Ridge Path has the best views of Taipei City of really any of the mountains. You can see the entire city, and are still near to Xinyi and 101. At 9-5 peak it seems you are about level with the observation deck on 101. The Ridge Path begins at Thumb Mountain, and ends at the swing on the Beixing Temple swing. It does continue on eventually ending somewhere near Academica Sinica, but I've not headed that way. Ascending after Thumb mountain, there is a fork with a path heading down to the valley behind the mountains. The left path goes up onto the Ridge Path. It connects a few places I'll describe below. A fast way down the mountain! Basket used for bringing materials up the mountains. A bare outcrop on the west end of the Ridge Path. Reached by an easy climb, but the ground is uneven and ropes are provided. There are 360 degree views from the peak and it's not obscured by trees. Not unknown, but much quieter than 9-5 peak. One of the best places to watch the sunset in Taipei. Near the Nangang TV antenna is another large boulder called Jiuwu Feng (9-5 peak). I've heard various stories about this name. I like the one about a general who walked up there every day until he was 95 the most so let's go with that legend. This boulder has great views of Taipei and is a good sunset spot. It is quite popular on weekends, as is the rest of the Ridge Path. Nearby is a basket and pulley system which looks like a speedy/deadly way down the mountain. Not really a village; this is a collection of sculptures, huts and fish ponds built some 15-20 years ago by an obviously eccentric farmer, and I would think some helpers. It's a very unusual place. The first time I found it was near sunset, on a quiet weekday evening with no-one around. I was a little dehydrated and It felt quite unreal then. I was unable to find it again for months, and I almost began to wonder if it had been real. The huts are made from old doors and furniture but are very well built and attractive. A covered wooden bridge goes across a large pond with koi carp. The gardens are well kept and full of strange kitsch sculptures and models. I met the caretaker a couple of times who explained the history. It doesn't appear on any official trail map (actually the entire path up here doesn't) and I believe it may be private land.